I knew when I wrote my piece that I was walking through a minefield of controversy, first of all because I challenge the dominant discourse on immigration and call into question many of the orthodoxies of a new generation of immigration scholars. I therefore came prepared to engage in verbal battle with outraged critics whose scholarship has been called into question. Alas, they did not show up at the table! This is worth noting because it points up something about the wiles and dynamics of hegemonic discourse: we are compelled to engage their arguments but they can afford to ignore ours. 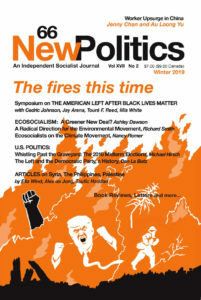 After all, who reads New Politics? I have two answers to that. One is that our shared commitment is to develop what Edward Said called "antithetical scholarship" that opposes hegemonic discourses and that represents the interests and viewpoints of subaltern groups. We do this not only as a moral and political commitment, but also to advance knowledge claims that form an epistemic foundation for political action, now and in the future. But my other answer is that people do read New Politics! I have been struck over the years, including this time, to discover that our message gets "out there," albeit through circuitous routes. Thanks to the Internet (and Steve Shalom's magic), there is no longer such a thing as a "fringe journal." My article also challenges certain articles of faith among the Left, and I expected to get an earful from them as well. This in fact will come to pass in another venue (the winter issue of the New Labor Forum is republishing my NP article, along with critical comments from Adolph Reed, Gary Gerstle, Peter Kwong, and Maria Elena Durazo and David Koff of Unite Here). By and large, the responses here from New Politics readers do not take issue with my core argument. So much the better. As much as we on the Left relish contention, it is perhaps more constructive to have a dialogue that fleshes out progressive thinking on immigration, and explores implications for politics and public policy. Gregory Squires provides an empirical foundation for this dialogue with a lucid synthesis of recent literature on race showing 1) the deep and persistent inequalities between African Americans and others; and 2) persistent racism in job markets, housing, and other areas, leading to sharp difference in the quality of life, reflected in vital statistics on health and longevity. All of which validates the prescient warning of the 1968 Kerner Commission that the United States was "moving toward two societies, one black, one white — separate and unequal." What the Kerner Commission could not know was that in subsequent decades there would be a massive influx of over 25 million legal immigrants, and millions more who are undocumented. The conclusion is inescapable that, as "the last hired," African Americans have been pushed further back in the hiring queue, and yet this simple truth has been the subject of denial and evasion by left-leaning immigration scholars. Yes, immigration struggles warrant the concern of progressives too, but Squires is on target when he writes that justice "cannot be pursued at the expense of the group which has experienced the most extensive and abusive treatment throughout the nation's history." Peter Drucker insists that there is no need to choose between African Americans and immigrants, and he presents us with the enlightened and progressive model of the Netherlands where immigrants are granted the same rights as non-immigrant workers. According to his reasoning, if immigrants are not paid less than other workers, the problem will be solved, since immigrants will not be given preference for jobs or undercut the wages of non-immigrant workers. I'm skeptical whether this formula works even in the Netherlands, since Drucker concedes that the success in incorporating Moroccan guest workers as Dutch citizens has only meant employers have turned to recent Polish immigrants who don't have the same protections. One would never know from Drucker's rosy account that in recent years Dutch immigration policy has become increasingly restrictive, that large numbers of illegal immigrants and asylum seekers have been expelled by force, and that laws have been passed making it difficult for immigrants to take advantage of the Dutch welfare system. Moreover, according to Philip Muus, a Swedish human geographer and expert on international migration, "ethnic minorities policies in the Netherlands have been relatively successful in areas of housing and education and in advancing legal rights, but far less successful in increasing minority participation in the Dutch labor market." But all of this is beside the point since the Dutch and American situations are so different as to vitiate Drucker's analysis. How can you compare a racially homogeneous nation like the Netherlands (prior to immigration) with the United States, with its system of occupational caste so entrenched that it is mitigated only by affirmative action policy? In such a context, immigrants in the United States, although themselves exploited and abused, are given racial preference in the labor market. So the problem is not that immigrants work for less, but rather that they are preferred over blacks. Indeed, studies conducted by William Julius Wilson and his students in Chicago found, much to their consternation, that the "reservation wage" (the lowest wage that workers would accept) was lower for jobless blacks than for immigrants. Yet employers still preferred immigrants, and engaged in what amounts to racial profiling in hiring. Providing more rights and entitlements to immigrant workers is certainly a desideratum, but it does not even begin to address the issue of entrenched racism in labor markets. Like Drucker, Ron Hayduk is concerned with the question of immigrant incorporation, and he has been in the forefront of the struggle for immigrant voting rights. To his credit, though, he does not allow those allegiances to obstruct his perspective on race, including the danger that "immigration could further reinforce racial hierarchies by pitting newcomers against the native-born, particularly African Americans." Nor is it just a matter of jobs. As a political scientist, Hayduk is sensitive to the fact that "just when African Americans have gained political power in electoral terms, they are watching their strength diminish." Thus, even as we applaud immigrant incorporation, we need to be mindful of the fact that it often comes at the expense of blacks (take Los Angeles and New York, for example). This presents a dilemma for activists. Much is at stake, because as Hayduk argues, "progressive efforts will likely falter without multiracial solidarity." As the sorry history of union racism and affirmative action show, "multiracial solidarity" has often meant that blacks are asked to subordinate their legitimate interests because they are too divisive among workers in general and union members in particular. As Hayduk acknowledges, "interracial solidarity" is a hollow slogan unless immigrants can see beyond their own struggles and actively support affirmative action and the reparations movement. For years, now, Mike Hirsch and I have sparred over issues of race and class, and particularly my critiques of William Julius Wilson in the pages of New Politics. Perhaps I forgot this, but Mike now divulges that he was a student and "a dear friend" of Wilson, adding that they have had their disagreements as well. But why does Mike feel compelled to say this, even in the name of "full disclosure"? What he reveals is his difficulty in separating the intellectual from the personal, which explains why he berates me for "overpersonalizing" and "finger-pointing" in my critique of Wilson. I do not know the man, and have no basis whatsoever for personal animus. Unless, as in the great Groucho Marx joke about not wanting to belong to a club that would take him as a member, I felt compelled to disdain the man who had showered praise on my first book! What would have been "personal" is if I had held my fire, and engaged in the mutual backslapping that is as rife in academic life as in the corporate world. Would Mike also berate Du Bois, as some of his contemporaries did, for "disloyalty" to Booker T. Washington to whom he owed his position at Tuskegee? Indeed, while at Tuskegee, Du Bois paid Washington back by writing Souls of Black Folks, which included a devastating critique of his patron. Intellectual life is seriously compromised unless we let the chips fall where they may. So is political life. Bill Clinton used to publicly invoke the name of "the brilliant sociologist, William Julius Wilson," to defend his waffling on affirmative action and his lack of any policy agenda for race, except for what Adolph Reed disdains as his "yackety-yak on race" initiative. Too bad that Wilson did not do what other "friends of Bill" did, and denounce Clinton publicly when he signed the bill that abolished welfare entitlements, and signed the crime bill that has sent hundreds of thousands of black youth to unconscionable years in prison, and then did nothing to stop the genocide in Rwanda. There are things more important than loyalty. Do these fighting words make me deserving of Mike's characterization of "Steinberg (an oxymoron right there) astride a muscular white horse, whip in one hand, pistol in the other"? I don't want to match Mike corn for corn, but I rather think that he is the one playing the gunslinger, riding in with both guns blazing, shooting wildly at any word that moves! In all seriousness, Mike makes a number of sage observations and barbed criticisms, but it seems to me that he does not engage my core argument, or for that matter, advance one himself. I'm not sure it is productive to draw our readers into each jab of our sparring match, so I will just close by saying that it has been helpful over the years to have Mike as a sparring partner, and he keeps me on my toes. I wonder though if he has a feminist voice in his ear, as I do, sighing about how "you men" need to engage in combat with metaphorical pistols and whips. Gilbert Jonas brings to the table a valuable historical perspective, seasoned by four decades on the front lines as an NAACP warrior. He provides an effective rejoinder to Mike Hirsch's skepticism about the extent to which mass immigration prevented blacks from being absorbed into Northern industries during the half century after slavery. He also brings into focus contemporary flashpoints of conflict between blacks and the Koreans, Indians, and Pakistanis who often dominate retailing and commerce in black communities. In effect, the United States has created its own class of "coloreds" who, as James Baldwin once said of Jews, "do the dirty work of whites in the ghetto." The critics may scoff at what they wrongly call "comparative suffering," but Jonas has no trouble asserting that "no group has ever faced the cumulative burden of racial oppression to the degree experienced by black Americans." Already Asian and Latino immigrants are far more integrated in terms of housing and jobs than are African Americans seven generations after the abolition of slavery. As some prognosticators have suggested, the nation is evolving into a black/not black divide. How can progressives, with their myopic fixation on "class," fail to face up to "the immigrant dilemma," as Jonas calls it, at a time when 50 percent of black men in New York City are either unemployed or underemployed? Alan Aja's intervention is most welcome, because Aja says things that I have rarely encountered in the vast immigration literature and because he suggests, by his example, some of the contours of a genuinely progressive approach to the immigration question. His personal identification with the struggles of immigrants does not mean that he puts blinders on and ignores the ways in which immigrants are implicated in the reproduction of racial inequalities. How could he, given that he is attuned to the problems of Afro-Cubans both inside and outside the Cuban enclave economy? Others have made this observation as well, but Aja is the first I have encountered who is willing to challenge the ethnic exclusivity of the celebrated "ethnic economy." Moreover, he uses the case of Afro-Cubans to draw the right theoretical inference: "The result throws out any credibility to arguments that cite ‘culture' as an indicator of economic mobility and instead places race smack dab in the middle of the equation." Smack dab is right. The predicament of Afro-Cubans and other Afro-Latinos provides ironclad evidence that the three most important factors that explain the plight of African Americans are racism, racism, and racism, both past and present, operating through precisely the intersecting institutional spheres that Greg Squires surveyed: incomes, jobs, family assets, housing, schools, the welfare system, and the criminal justice system, and finally manifesting itself in poorer health and truncated lives. Above and beyond the specific issues debated here, there is a larger issue that looms in the background. Progressives have to ask themselves how they can rail against neoliberal trade policy, and fall into silence when it comes to a neoliberal immigration policy that is designed to crowd labor markets, depress wages, and undercut unions, and that exacerbates the problems of African Americans and other marginal groups, including immigrants themselves. Or as we see in France, the children of immigrants who find themselves cast to the periphery, with the dreams of their parents dried up like, well, a raisin in the sun. The French intifada not only exposes the recklessness of neoliberal immigration policy, but also the urgent need for progressive thinking and a progressive agenda on race and immigration that does not subordinate one to the other. 1. Philip Muus, "The Netherlands: A Pragmatic Approach to Economic Needs and Humanitarian Considerations," in, Controlling Immigration: A Global Perspective, ed. Wayne A. Cornelius et. al (Stanford University Press, 2005), 283. 2. William Julius Wilson, When Work Disappears (University of Chicago Press, 1996), 139-40. For my critique of Wilson's study, see "Science and Politics in the Work of William Julius Wilson," New Politics (Winter 1997), 72-83. STEPHEN STEINBERG is a frequent contributor to New Politics. His last book, Turning Back: the Retreat from Racial Justice in American Thought and Policy, received the Oliver Cromwell Cox Award for Distinguished Anti-Racist Scholarship.